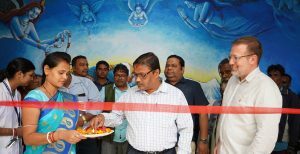 In December, M4ID and partners inaugurated a new and enhanced Basta community health centre in Odisha, India. Final strokes of paint, last few screws tightened, new carpets rolled out, a final sweeping of the floors – and a hug! In December, product design lead Nicolas Flittner had an exciting trip to Balasore district in Odisha, a state in Eastern India located by the Bay of Bengal. The trip marked an end to a two-year project, where a dedicated team working on the Lab.Our Ward project had been helping the local staff in improving their local community health centre in Basta village. “The aim was ambitious”, Flittner admits, “but the need for better and safer delivery in India is dire”. 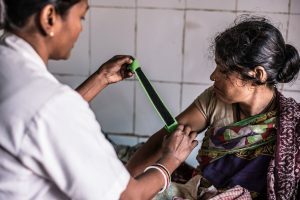 While maternal and infant mortality rates have dropped, complications during pregnancy and childbirth continue to claim the lives of thousands of Indian mothers and newborns each year. Considerable improvements have been achieved with the infant mortality rate down from 65 per 1,000 in 2006 to the current 40 per 1,000 births, but there is still room for further improvement. The maternal mortality continues to be quite high at 15 deaths per 1,000 births. The Lab.our ward looked at new cost-effective ways to deliver improved quality of care for mothers and newborns. “Even when births take place in a health facility, families face overcrowding, uncleanliness and the lack of essential health infrastructure in the facilities. For too many women, the experience of birth is still neither safe nor comfortable”, Flittner tells. Before and after. 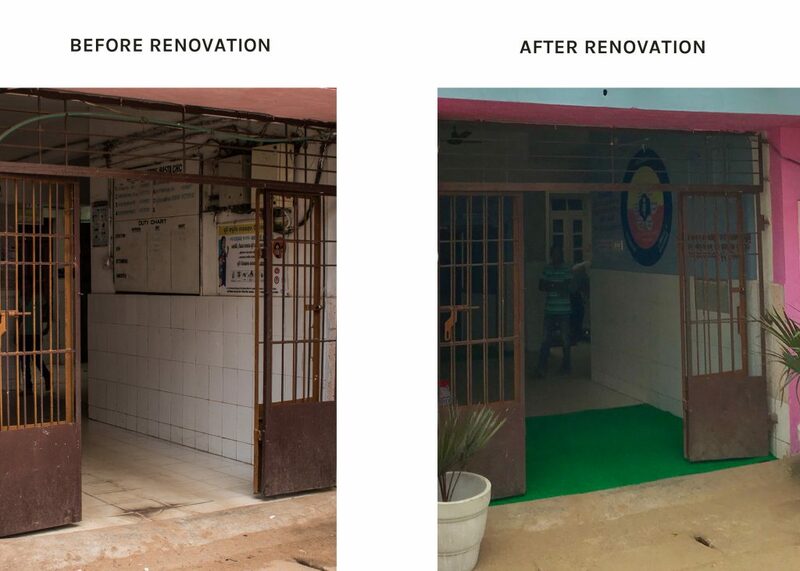 The courtyard of the health facility was redecorated to be a more homely environment that supports active delivery. A new roof was built, so that mothers could use the space in any weather for moving around during labour and using for example exercise balls. 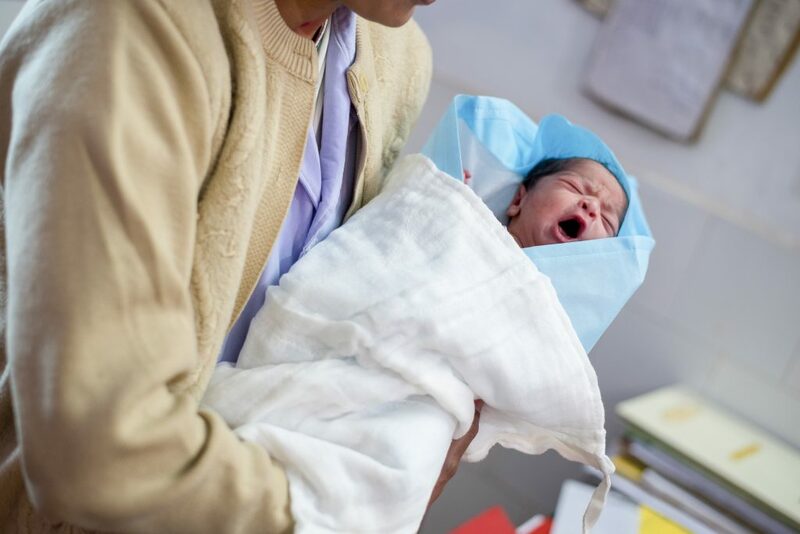 – “As the number of births taking place in health facilities continues to rise in Odisha, maternity wards must be adequately prepared to deliver high quality care to women and newborns across our State. We sought to improve health outcomes by practical application of and alignment to WHO’s Quality of Care framework”, Flittner explains. The work was completed together with the facility staff, and included many physical improvements, including plumbing and piping work, renovating rainwater drainages, ventilation and roofs, and improving the lightning. In addition, the facility was painted and new signs were installed to make the wayfinding easier. The product design solutions introduced included new delivery beds and privacy curtains for delivery and postnatal areas, improved storage systems, and new seating arrangements. Through the project, the team also got the government to support the facility with electric work and provision of new delivery kits. The hygiene of the facility was improved through cleaning work and installing new medical waste bins and segregating the waste bins from the general spaces. New hand scrubbing instructions and sanitizers were introduced and equipment from handrails to wall ladders were provided to facilitate active labour. In addition to products and spaces, services needed to be redesigned, so the facility staff were trained to use a set of service design solutions. The “Welcome card” contains essential information about the hospital, and reminds visitors and patients about keeping the area clean, washing hands and so on. The “Mother’s pass” contains the most important information about a woman who is coming to give birth, in addition to symptoms, which indicate, that one should come to the hospital immediately. 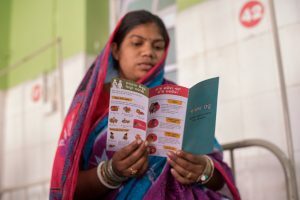 The “Companion pass” is intended for the mother’s companion, and it explains, what to take along to the hospital and how to best help the mother. In addition, the mothers now receive color-coded armbands during admission. They are used to help identify women’s care needs in the crowd at first sight, a triage of sorts. With colour coding, one can prioritize following up the clients according to need. Red arm band means a high-risk pregnancy, blue armband normal level of risk and so on. Best reward for the hard work: safe deliveries and happy, healthy babies!